The S cushions replace worn out or lost pads for Grado Headphones. The Grado L Cushions or Bowl pads, replacement pads for Grado headphones. Anti Vibration strips to improve the sound of headphones including IEMs! TTVJ Flat Pads - the original Grado pads available only at TTVJ! New improved Flat pads for Grado headphones! 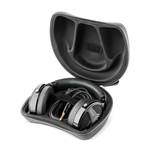 Focal delivers a nice looking, sturdy hard shell case for their awesome headphones! Replacement pads for the Focal Elear headphones! Fits the Utopia also! Replacement ear pads for the utopia headphones. Also fit the Elear headphones!